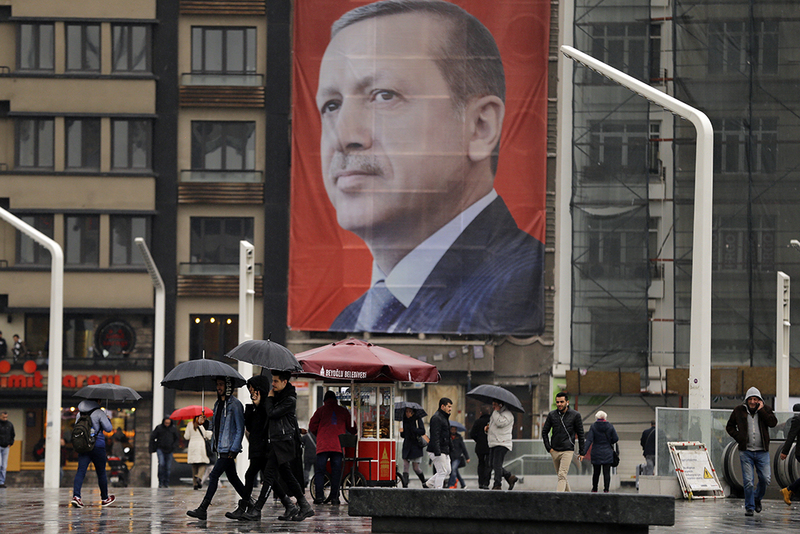 People walk in central Istanbul's Taksim Square, backdropped by a poster of Turkish President Recep Tayyip Erdoğan, March 14, 2017. Turks will vote April 16 in a referendum on proposed constitutional amendments that would greatly enhance the power of the presidency and reinforce Turkey’s democratic decline. On April 16, the Turkish people will vote on a package of constitutional amendments passed by Turkey’s Parliament on January 21, 2017, that greatly expands the powers of the presidency. If the package passes the nationwide referendum, it will broaden and deepen the de jure powers of the presidency, giving it authority over all executive branch institutions, including the military. It would give the president the power to appoint key senior-level judges and other judicial officials without parliamentary—or any other—review. It would abolish the post of prime minister, with the president assuming the powers of that office. And it would allow, under certain circumstances, the president to serve three terms totaling just short of 15 years. In short, Turkey’s long-standing parliamentary political system would be transformed into something more appropriately called a presidential system, in which an “executive presidency”1 amasses unprecedented power in the hands of one man. The referendum will take place amid the ongoing erosion of Turkish democratic institutions, freedom of speech, and political rights. Moreover, the referendum campaign and the vote itself will be held under some of the least democratic circumstances imaginable—namely, emergency rule. The president could shape the executive branch as he chooses, as long as Parliament approves his budget for that purpose, and could hire or fire all senior officials as he chooses, without parliamentary or other review. Bypassing Parliament, he would also be able to issue decrees with the force of law in many areas of Turkish life, particularly regarding economic and social concerns—unless Parliament acted to override the decrees. Contrary to long-standing tradition, the president could be a member, even the leader, of a political party, casting aside the notion of the presidency as a symbol of national unity set above political parties. When the president’s party holds a parliamentary majority, checks on presidential power would be virtually nonexistent. When the president’s party does not hold a majority, Turkish parties and institutions would have to cooperate or risk government gridlock, even chaos—the very conditions that current President Recep Tayyip Erdoğan and the Justice and Development Party, better known in Turkish as AKP, government claim that the new system would prevent. Turkey would be one of the few countries in the world to sever fully the electoral tie between the head of government and the legislature; the United States, Indonesia, and the Republic of Cyprus are among the other rare examples. However, Turkey would be the only country in which the head of government and the legislature could force one another into early elections and in which both would always have to face election on the same day as the other; the president would have the upper hand in this respect, as he could call elections at any time, whereas Parliament would need to muster a three-fifths majority. Parliament would lose some important powers under the new amendments, though its legislation would still take precedence over presidential decrees. On paper, the new structure would create a presidency with vast powers, but—depending particularly on whether the president’s party controls Parliament—it would be somewhat less powerful than the unfettered, one-man dictatorship widely expected by Erdoğan’s critics and possibly craved by Erdoğan himself. Voters will go to the polls knowing that a “yes” vote will significantly increase the president’s already considerable power, fortify Turkey’s growing reputation for authoritarianism, and further alienate Turkey from its NATO allies. President Erdoğan first spoke favorably of a strong presidential system shortly after becoming prime minister in 2003 and began to advocate for it ever more insistently starting with his second prime ministry re-election campaign in 2011.3 At that point, his determination to run in Turkey’s first-ever direct presidential election—in which the Turkish people, rather than the Parliament, would choose the president—in 2014 was already clear. Elected in August 2014 to a presidency already informally strengthened by its direct electoral mandate, Erdoğan intensified his advocacy to further bolster presidential powers. Moreover, he built a de facto presidential system, making clear that he—not his hand-picked successor as prime minister, Ahmet Davutoğlu—was the top decision-maker in Turkey and in the AKP. With no parliamentary majority having emerged following the June vote, Erdoğan called for new elections to be held in November 2015.5 In the campaign for these “do over” elections, conducted amid the resumption of fighting in Turkey’s long-running Kurdish conflict, the AKP de-emphasized the presidential system, and Erdoğan kept an unusually low profile. The AKP then regained its outright parliamentary majority, allowing Erdoğan to resume his de facto empowered presidency. Despite the win, the AKP majority that emerged from the November election—317 seats, roughly 58 percent of the 550-seat Parliament—was insufficient directly to pass a constitutional amendment, which requires 367 votes in Parliament, or to put proposed constitutional changes to a referendum, which requires 330 votes in Parliament.6 With the other three parties in Parliament openly opposed to a presidential system, Erdoğan’s hopes for formalizing a strong executive presidency appeared distant. Bahçeli had made opposition to a presidential system the centerpiece of both of the MHP’s 2015 parliamentary campaigns, so his October 11 speech electrified the political environment and visibly galvanized Erdoğan and his circle into action. With 40 seats in Parliament, the MHP could potentially provide the votes that the AKP needed to bring constitutional amendments to a referendum, and the AKP pounced on the opportunity. On January 21, the vote on final passage garnered 339 “yes” votes, just nine over the required threshold.25 Assuming all 316 eligible AKP MPs voted “yes,” that meant they were joined by only 23 of the 39-person MHP caucus, with 16 MHP MPs refusing to join their party leader in supporting the measure. The MHP caucus had shrunk from 40 to 39 members in mid-November with the party’s expulsion of Ümit Özdağ, a rival and bitter critic of Bahçeli’s and a vocal opponent of the presidential system. Özdağ remains in Parliament as an independent MP.26 Thus, 17 members of the MHP’s originally 40-MP caucus apparently voted against the package. The following section highlights the most important changes proposed in the amendments package, examines their likely implications for future Turkish governance, and considers some of the unexpected ways in which they could possibly play out. It is not, however, an exhaustive review of every change proposed in the 18-article package. One school of thought contends that the details of the amendments make little difference, as President Erdoğan intends to govern as an authoritarian regardless of what the law says; that he has ignored or manipulated constitutional practice in the past;32 and that he will do so again. While there is merit to this argument, the analysis below treats the contents of the amendments package seriously, without questioning whether implementation would indeed follow the letter of the proposed laws. There are at least three good reasons for taking the text seriously. First, the amendments provide insight, however inexact, into Erdoğan’s conception of a presidential system, the MHP’s bottom-line requirements, and both Erdoğan’s and the MHP’s sense of what the Turkish electorate would find acceptable. Second, should the amendments package pass, its terms may apply for many years beyond the Erdoğan presidency. The current constitution came into force more than 34 years ago; although it has been repeatedly amended, most of its original provisions still apply. Third, and finally, there remains the possibility that the new rules indeed will be scrupulously observed by all parties, including the president. Even prior to passage in a referendum, the amendments package represents a path-breaking development for Turkey and a triumph for Erdoğan. With the package, Erdoğan has taken a significant step toward realizing his goal of a strong presidential system of government, moving Turkey away from the parliamentary system that has ruled it since 1950, with the exception of periodic military rule.33 Turgut Özal and Süleyman Demirel—like Erdoğan, former prime ministers subsequently elevated to the presidency—each advocated “a presidential system,” but neither developed a specific proposal, much less had it introduced and passed in Parliament.34 Actual passage of Erdoğan’s amendments package in a public referendum would be historic and mark a dramatic change in Turkey’s system of governance. Erdoğan has often spoken of introducing a presidential system in the context of a new constitution. The goal of a new constitution has thus far eluded Erdoğan, but the amendments package would have a transformative impact on the old constitution. Presidential power of decree. The most significant new power the proposed amendments would accord the executive branch—that is, beyond those already inherent in either the presidency or the prime ministry—is the president’s right to issue a decree—kararname—with the force of law. One might have expected the package to include an unlimited power of decree for the president, as is the case under the state of emergency currently in force in Turkey. In fact, the president’s decree power is not unlimited under the proposed amendments—the limits are discussed in the next section—but it is considerable. In the absence of parliamentary action, the president would have wide scope to issue decrees with force of law on social, economic, and even political issues. Under the proposed amendments, the president would appoint six of the 13 HSYK members and parliament would appoint the other seven. If the president’s party controlled Parliament, therefore, the president could end up, through his influence over the party, effectively appointing all 13 members. As the president already appoints the vast majority of Constitutional Court judges, his relationship to that court would be little altered by the new system. The main change is that the two slots on the court constitutionally reserved for military judges would be eliminated once the incumbents complete their terms or otherwise depart. As a result, the Constitutional Court would have only 15 judges, all civilian. As before, three would be appointed by Parliament, and the remaining 12 would be appointed by the president. The HSYK’s power over judicial appointments gives it influence over many other parts of the government as well, including ostensibly autonomous institutions in which the judiciary plays a role. For example, the Supreme Board of Elections, which supervises all aspects of Turkey’s elections, consists of judges and prosecutors elected by peers in two of Turkey’s most important courts, the High Court of Appeals and the Council of State; all of the peers are appointed by the HSYK or directly by the president. Overall, increased control of the HSYK seriously reinforces the president’s power in the proposed system. Passage of the amendments would cap Erdoğan’s aggressive campaign to assert full control over the judiciary. Following a dramatic December 2013 corruption scandal that rocked the AKP government—driven by investigations initiated by elements of the police and the judiciary—Erdoğan pushed restrictive legislation aimed at reining in the HSYK’s autonomy and laying the groundwork for the election of pro-Erdoğan judges as members of the HSYK in 2014.44 This, in turn, created the basis for an internal HSYK crackdown on judges and prosecutors believed to be Gülenists, or followers of the semi-secretive religious movement that Erdoğan argued had infiltrated the judiciary and orchestrated the corruption allegations. Removing the president.46 Under the current constitution, the president can be impeached only for “vatana ihanet,” or “high treason.”47 A petition by one-third of all MPs is necessary to initiate this process; a vote by three-quarters of MPs is required for the president’s actual removal. With the proposed amendments, the president would be liable for removal for a wider array of crimes, but the process of achieving his actual removal would be complicated and not fully in the hands of the Parliament. The crimes for which a president could be removed under the proposal are the same as those that currently make a citizen ineligible to run for Parliament—bribery, corruption, theft, and the like.48 Significantly, governance-related abuse of power does not seem to be a cause for removal.49 Thus, it is not clear what recourse Parliament would have if the president were to refuse to implement its laws or abide by court decisions. To pursue removal of a president, a majority of MPs would have to propose to open an investigation, or soruşturma, into an alleged crime. Following discussion lasting no more than a month, three-fifths of MPs would have to vote actually to open the investigation.50 A commission of investigation would then be appointed, and, following the commission’s report, two-thirds of MPs would have to vote to send the president to the Supreme Court for trial.51 If convicted by the Supreme Court, the president would be removed from office. Further civilianization. President Erdoğan has used his authority during the state of emergency following the coup attempt to strengthen his grip on the military, particularly by bringing the military chain of command under the authority of the Ministry of National Defense and by bringing military schools under the purview of the Ministry of National Education. Previously, the military was under the prime minister and the president—not the defense minister—and controlled its own education system. Several other measures included in the amendments package would complete this process of enhanced civilian control of the military, downgrading the military’s ability to influence civilian life. Under the proposed new system, for example, performance of military service would no longer be a requirement for parliamentary candidates. And, as noted, the two constitutionally mandated military judges would be eliminated from the Constitutional Court. All military courts would be abolished, except those with the sole purpose of internal military discipline. The military, for the first time, would also be subject to investigation by the State Supervisory Council, an Inspector General-like institution appointed by and attached to the presidency—an important step that would put the military on par with other executive branch agencies. The amendments package would grant tremendous power to the presidency, but there remain some limits. Below are some of the ways in which presidential powers are modified in the prospective new system. Restraints on the presidential right of decree. One might have expected the amendments package to include an unlimited power of decree for the president, as is the case under the emergency rule currently in force in Turkey. In fact, the president’s decree power is considerable but not unlimited. In the absence of parliamentary action, the president would have wide scope to issue decrees with force of law on social, economic, and even political issues. But presidential decrees could not overturn or contradict existing laws passed by Parliament or limit basic freedoms guaranteed in the constitution. Decrees also could not touch on the many areas where the constitution specifically requires a law—or kanun—passed by Parliament.56 Moreover, Parliament could pass laws that modify or overturn presidential decrees. Thus, at least on paper, Parliament would remain the ultimate law-making body. Presidential decrees also could be appealed to the Constitutional Court.57 Recent experience suggests that Constitutional Court judges tend to back the president—especially the president who appoints them. And on at least two occasions, Erdoğan has simply ignored Constitutional Court rulings he disliked.58 Indeed, if the amendments package passes into law, courts are likely to be less of a check on the executive branch in the future. Still, their formal authority would be intact, leaving open the possibility that they might reassert their prerogatives in the future. The term başkan does appear in one place in the amendments package, where it says, “The President represents the unity of the Turkish Republic and the Turkish Nation in his role as Chief of State [Devlet başkanı].”64 This would replace current wording, which speaks of “his role as Head of State [Devlet başı].”65 The former title perhaps connotes the greater authority the president would have under the new system, but its usage does not appear to carry legal implications in this context, as it seems to refer to the symbolic role of the president. It also does not appear elsewhere in the package in reference to the president. Pledging fealty to former President Mustafa Kemal Atatürk. The presidential oath of office remains unchanged, including the pledge to “safeguard … the principles and reforms of Atatürk, and the principles of the secular republic.”66 Erdoğan generally downplays the legacy of the secularist founder of Turkey—a preference reflected in recent changes to school curricula67—but has stopped short of changing the presidential oath of office in order to do that.68 The parliamentary oath, with its similar formulation, is also left unchanged. From a political standpoint, removal of the references to secularism and Atatürk would have caused a firestorm in Turkey and quite possibly alienated many potential “yes” voters, including many AKP voters who venerate Atatürk. Keeping these references in the oath anyway has little substantive impact; they do not impede Erdoğan from taking whatever course of action he sees fit. In sum, the president would retain all the powers he holds under the current constitution, except the right to dissolve Parliament with impunity, which has never been used. In addition, the presidency would pick up all the powers of the prime ministry, along with several new privileges. There are some limits on presidential power—overall, the authorities fall short of the near-dictatorial power the president enjoys under emergency rule—but the changes nevertheless consolidate tremendous power in the empowered presidency. The new package would limit the president to two five-year terms, with one exception: If Parliament calls for early elections during his second term, the president could run for a third term. Parliament would lose power in the proposed system in two major ways. First, the president’s wide-ranging right of decree is certain to erode Parliament’s position and prestige as the central lawmaking body in the land. The president would be able to issue decrees quickly and decisively, overshadowing the slower and more cumbersome parliamentary process, even if one party holds a decisive majority. If Erdoğan becomes president with an AKP majority in Parliament under the proposed system, he is likely to be the primary legislator via decree, with Parliament acting as a rubber stamp, fortifying his decrees by putting them into law. Second, Parliament would lose leverage, in concrete terms, in its interface with the executive branch. Parliamentarians could no longer put questions directly to the head of government—the president—as they do to the current head of government, the prime minister. In fact, they could not put oral questions to the leadership at all. They would be limited to submitting written questions to ministers and to the vice president or vice presidents. Granted, this would not be very different from the current situation, in which Erdoğan is the de facto head of government but is beyond the reach of parliamentary questions. Parliament also would lose the right to pass censure motions against a minister, ministers, or an entire government.73 Via censure motions, Parliament can currently fire a minister or bring down a government.74 While such actions are rare when one party forms the government and holds a parliamentary majority, the power of censure carries a strong symbolic significance as a reminder of Parliament’s ultimate centrality in the current system. Such a power would be particularly important in a system where Parliament could be dominated by a party other than that of the head of government, as could indeed happen under the newly proposed system. That possibility probably explains why Erdoğan seeks to remove it from Parliament’s arsenal. Despite losing the power of censure in the proposed system, Parliament would retain the right to pursue legal action against a president, vice president, or Cabinet minister suspected of committing a crime. The proposed system would be unique among world governments in combining the following characteristics: a strong president; no prime minister; always simultaneous presidential and parliamentary elections; and the ability of Parliament and the president to dissolve one another and go to early elections. At least one other European country, the Republic of Cyprus, has the first two characteristics, but its electoral terms are fixed, without the possibility of early elections. Perhaps the most intriguing aspect of the proposed new system is the prospect that voters will cast two separate ballots for their leadership—one for president and one for a party list of parliamentarians. Turks have previously voted only for parliamentarian, with government formation determined by the number of parliamentarians elected nationally by each party, as is the case in most parliamentary systems. In 2014, Turks also began direct election of the president, though the position, as currently constituted, is meant to be nonpartisan,79 with the president officially head of state, not head of government.80 In his practice of the office, Erdoğan has largely ignored that restraint. It is safe to assume that, in crafting the proposed amendments, Erdoğan envisioned remaining president, buttressed by an AKP parliamentary majority, for years to come. That indeed is what most people expect to happen, and Erdoğan has many formal and informal ways to advance that prospect. If that scenario does occur, one-man rule would be the likely outcome. Yet the proposed system opens the door to many possibilities that Erdoğan has perhaps not envisioned. Voters would presumably be able to vote for a president and parliamentarian of different parties, creating the possibility of split tickets and shared government, or “co-habitation.” Voters who separately elect their legislature and head of government or powerful head of state—such as in the United States; France; the Republic of Cyprus; and Israel, from 1996 to 2001—often opt for co-habitation, which provides an automatic check on executive power.81 Israel actually abandoned the system of separate elections in 2001 because of the governance complications it created and returned to a pure parliamentary model. Second, the president could dissolve Parliament and call new parliamentary elections at any time, unless he were formally under investigation for a crime.83 If Parliament refused to pass a law the president wanted, or if he feared Parliament were about to take an action he opposed, the president could simply dissolve Parliament. While the president already has that power under the current constitution, it has never been invoked, as noted. Under the proposed system, however, there is a significant deterrent to presidential use of the power of dissolution: Presidential and parliamentary elections must always be held at the same time. Thus, by dissolving Parliament, the president is also “dissolving” himself; he, too, would face new elections. In addition, the president can normally only be elected twice; therefore, by calling new elections, the president limits the potential duration of his presidency.84 After a president is elected a second time, a presidential call for early elections would mean an end to the incumbent’s presidency. Accordingly, a presidential decision to call early elections in either term—particularly the second—would never be taken lightly. Parliament and elections. Under the proposed system, Parliament also could call early elections with a three-fifths, or 60 percent, vote, triggering a simultaneous parliamentary and presidential election. Electorally speaking, the presidency and the Parliament are tied at the hip in the proposed system. Therefore, if Parliament were disgruntled with a president, it could shorten his term by calling early elections during his first term. If Parliament were to call early elections during the president’s second term, however, the president could run for a third term.85 But were Parliament to call early elections during the president’s third term, there is no provision for the president to run for a fourth. Thus, his third term would be his final one, whatever its duration. Of course, to prevent Parliament from calling early elections, the president would need the support of only two-fifths—40 percent—of the MPs plus one, which is likely to be a low bar in most circumstances. It is theoretically possible that Parliament could sideline a president by calling a series of early elections, but this turbulent scenario is unlikely for at least three reasons. First, such a contrary Parliament is unlikely to be elected; in most cases, someone sufficiently popular to be elected president would be able to count on at least 40-percent-plus-one-seat “blocking” support in Parliament.86 Second, and most importantly, by calling early elections, parliamentarians would be risking their jobs, since they would also have to face the voters. Third, the fact that pensions and certain other benefits for parliamentarians traditionally kick in only after a Parliament has served two years87 has generally discouraged early elections in the past—though it is not an absolute impediment, as shown in 2015. Given the mutual disincentives, it seems likely that both the president and the Parliament would normally want to serve their full terms. Even if the president’s party does not control Parliament, the president and Parliament may prefer to find a basis for cooperation, or at least coexistence, rather than go to new elections. But what if a new parliamentary election had also required a new presidential election, as would be the case under the newly proposed system? Would Erdoğan have risked that, particularly in the aftermath of an election in which he barely topped the 50 percent threshold?92 And even if Erdoğan had felt certain that he personally would win new elections, would he have been willing to end his first term in office after just a few months, just for the sake of dissolving a Parliament in which his party held a strong plurality but not a majority? Possible, but unlikely. More likely, he would have at least tried to rule by decree, hoping that the three opposition parties—constituting 53 percent of Parliament—would not coalesce to pass laws objectionable to him or to overrule his decrees. To actually pass legislation—such as the budget—Erdoğan would have had to seek ad hoc majorities with the help of non-AKP parliamentarians.93 In such circumstances, the president and Parliament might have no choice but to find a way to coexist as comfortably as possible. What about Parliament in the aftermath of the June 2015 elections? Would MPs have sought new elections under the newly proposed system? The AKP could have prevented dissolution, if it so chose, with its 40-percent-plus “blocking majority,” but, lacking 60 percent, it could not have initiated elections on its own. The actual Parliament elected in June 2015 did have to go to new elections, not because of an affirmative choice to do so but because it failed to form a government within the constitutionally allotted time frame. Under the proposed system, there would be no formal coalition formation and no vote of confidence; thus, there would be no automatic triggering mechanism requiring dissolution of Parliament and new elections. Only an affirmative vote by 60 percent of Parliament or a presidential decision could force early elections. AKP spokesmen praise the fact that the new system would not entail coalition formation.94 However, the lack of an agreed-upon coalition could necessitate ad hoc legislative coalitions or produce a legislative stalemate in which the only “legislation” comes in the form of presidential decrees. Or it could produce a situation in which a Parliament at odds with the president manages to override presidential decrees and seize the initiative from him. The likelihood of a divided government would mainly be determined by the mood of the electorate. Simultaneous presidential and parliamentary elections mean that ballots cast for both institutions would reflect the same moment in political time, probably increasing the chances that voters would cast their ballots for presidential and parliamentary candidates of the same party. Reinforcing this likelihood are two other factors. First, party loyalty is quite strong in Turkish political culture. Second, in voting for Parliament, Turks vote for a party list rather than an individual—unless voting for an independent candidate or a write-in; thus, voters are unlikely to split their ticket based on affinity for an individual parliamentary candidate. Ticket splitting, however, could appeal to voters who are determined to establish checks and balances—limiting the influence of a newly empowered president, for example—or who are particularly enthusiastic about a certain presidential candidate but generally favor a different party’s parliamentary list. Only experience will tell how voters choose, if the proposed system is indeed implemented. The proposed electoral system’s design seems to create an opening for a party that significantly reflects voter sentiment and can work with the president yet is also capable of independence from him. Given Erdoğan’s dominance, this would point to a classic center-right, traditionalist but secular party—the sort that dominated Turkish politics throughout most of the 1950–2002 period.95 No such party of consequence currently exists, however. Some elements of the new system would go into force prior to the elections, however. For example, the president would be able to join a political party as soon as the referendum is passed,97 and the new HSYK—renamed simply HSK98—would become operative 40 days after results of the referendum were published.99 Parliament and the president are supposed to lay the legal groundwork for the new system within the first six months after passage of the referendum.100 Although it’s not explicitly stated in the text, it appears that the prime ministry and the current form of the Cabinet would disappear—and that the vice presidency would be established—only after the double election. The proposed presidential system would offer certain advantages in the conduct of foreign policy. With the elimination of the prime ministry, the president would be clearly in charge of foreign policy decisions, aided by a foreign minister appointed by and directly responsible to him. Foreign governments might also welcome an end to the uncertainty that can result when a constitutionally empowered prime minister and a politically empowered president—such as Erdoğan or, for a time, Özal—vie for foreign policy dominance. Implementation of the presidential system would likely create problems in relations with the West, however. First, the diminishing of Parliament’s status in favor of an exalted presidency could well have the effect of distancing Turkey from the European Union, where virtually every country has a Parliament-dominant system. Turkey’s Parliament-based system has tended to make it feel more familiar to Europeans; under the proposed system, that might cease to be the case. Admittedly, this possibility may be of decreasing concern to Erdoğan—and Turks generally—as Turkey’s EU membership prospects fade.102 Second, the new system is certain to be seen as less democratic than the previous one, and thus it is likely to alienate Turkey from the United States and others in NATO, which views itself as an alliance of democracies. For many years, polls showed the Turkish electorate to be decidedly against a presidential system in the abstract. In more recent times, opinion has been divided. With the introduction of the proposed new system on December 10 of last year and its passage by Parliament on January 21, voters finally have a specific proposal to which to react, and it is difficult to predict how public sentiment might shift. The AKP’s dominance of the media and state institutions is certain to be an important factor, especially since the campaign and referendum will take place under emergency rule. Given Erdoğan’s determination to achieve a presidential system, one can assume that he will draw on every resource available to him to achieve passage; failure would be a powerful blow to his prestige. The new system would endow the Turkish president with more power than any civilian leader has enjoyed in that nation since the end of İsmet İnönü’s presidency in 1950. If the referendum passes, Erdoğan wins the presidency, and the AKP wins a parliamentary majority again in 2019, one-man rule is very likely. From a distance, this may not seem very different from the current situation. After all, President Erdoğan already effectively combines the offices of president and prime minister. The official prime minister, Binali Yıldırım, appears to be slavishly obedient to Erdoğan’s will and was put in his position by Erdoğan for that very purpose. Likewise, AKP parliamentarians follow Erdoğan’s lead. However, in addition to the institutionalization of the empowered presidency, the onset of the new system would complete the profound transformation of two major institutions of the Turkish state: the judiciary and the military. Both of these once autonomous institutions—the two strongest pillars of the Atatürkist system—would now be firmly under the president’s thumb. Erdoğan’s takeover of those institutions was already well underway before the constitutional amendments were introduced, of course. But with emergency rule and potential passage of the amendments package, that process would be complete. In sum, the amendments would endow the president and the executive branch with far more power than provided by the current Turkish Constitution, at least in normal times. However, the president would not have the near-dictatorial authority that he currently holds under emergency rule—there would be judicial review, a potentially louder parliamentary voice, and some limits to the scope and applicability of presidential decrees. Erdoğan may have wanted to enshrine something close to his current authorities under the state of emergency, but he accepted a presidency that, in most cases, would be very powerful but not quite unassailable. The prospect of ticket splitting offers some hope for checks and balances to presidential power, but only if the elections are conducted in a manner that allows all parties to get their message out, unimpeded by the government. The possibility of divided government has been overlooked in most analyses of the amendments package, probably because most people assume that Erdoğan and the AKP will be returned to power or will find ways, legitimate or not, to make sure they remain in power. Still, in a free and fair election, it is possible to imagine scenarios in which Erdoğan or the long-ruling AKP might not come out on top. More importantly, a constitution must endure and be more than a vehicle for any one political moment. Whatever the system, Parliament will struggle to fulfill its role as representative of the people until parliamentarians are truly beholden to voters for their jobs, rather than to party leaders. Under the current system, virtually every candidate—as well as his or her district assignment and placement on the ticket—is chosen by the party leader rather than by primary and then faces election based on party-list, rather than single-candidate, voting.110 Changing that element of the current system would make Parliament far more independent and Turkey far more democratic, whether in the current system or in the one envisioned in the proposed amendments package. An up-or-down referendum on the entire amendments package will be held April 16, and the vote is likely to be close. Based on a recent survey, the odds of winning a referendum would be much greater had Erdoğan been content simply to take over the prime minister’s responsibilities and assume unassailable dominance of the executive branch, including the military, while forgoing the idea of presidential decrees. However, the power to issue decrees is central to Erdoğan’s concept of what a strong presidency should be. Should the referendum pass, Turkey will have its first presidential system in nearly seven decades,111 and, should the inaugural 2019 elections go as he anticipates, Erdoğan will have achieved his long-held dream, putting himself in position to institutionalize his political dominance, with the prospect of ruling for another generation. Party A wins 60 percent or more of MPs. Likely implication: One-man presidential rule, as Party A MPs carry out president’s legislative will. Party A has votes to call for early elections but no incentive to do so. Party A wins more than 50 percent of MPs but less than 60 percent of MPs. Likely implication: 1) one-man presidential rule, as Party A MPs carry out president’s legislative will; or 2) Party A has sufficient votes to prevent opposition party or parties from forcing early elections. Party A wins 40 percent to 50 percent of MPs. Likely implications: 1) neither Party A nor the opposition has sufficient votes to force new elections; 2) president rules by decree and can seek ad hoc coalitions to pass laws in Parliament; or 3) president at risk that opposition party or parties could override the decrees by passing legislation. Party A wins less than 40 percent of MPs. Likely implications: 1) president rules by decree; 2) opposition party or parties can pass overriding legislation; or 3) opposition party or parties can call for new elections, forcing the president to end his term prematurely. If president calls for new election, simultaneous new presidential and parliamentary elections will be held. Party A wins 60 percent or more of MPs. Likely implications: 1) one-man presidential rule, as Party A MPs carry out president’s legislative will; or 2) president can conspire with Party A parliamentary group to have Parliament call for early elections, thus allowing the president to run for a third term. Party A wins more than 50 percent of MPs but less than 60 percent of MPs. Likely implications: Same as I-B. Party A wins 40 percent to 50 percent of MPs. Likely implications: Same as I-C.
Party A wins less than 40 percent of MPs. Likely implications: 1) president rules by decree; 2) opposition party or parties can pass overriding legislation; or 3) opposition party or parties can call for new elections, recognizing that the president could then run for a third term. President legally can call for early elections, but doing so would bring his presidency to a premature end. Party A wins 60 percent or more of MPs. Likely implication: Same as I-A. Party A wins 40 percent to 50 percent of MPs. Likely implications: Same as I-B. Party A wins less than 40 percent of MPs. Likely implications: 1) president rules by decree; 2) opposition party or parties can pass overriding legislation; or 3) opposition party or parties can call for new elections, ending the president’s term. Alan Makovsky is a Senior Fellow on the National Security and International Policy team at the Center for American Progress. Prior to joining the Center, from 2001 to 2013, he served as a senior professional staff member on the Committee on Foreign Affairs in the U.S. House of Representatives, where he covered the Middle East, Turkey, and other related issues. He is also a former State Department official and the founding director of the Turkish research program at The Washington Institute for Near East Policy. I would like to thank the following individuals for the useful discussions and insights that they contributed to this report: Sabri Sayarı, emeritus professor, Sabancı University (Istanbul); Ebru Ağduk, Dilek Ertükel, and Arife Kӧse of the National Democratic Institute (Ankara); and Onur Sazak, Ph.D. candidate, Sabancı University. Of course, the author is solely responsible for the analysis and accuracy of the information contained herein. The official name for the legislation that includes the amendments package is “Türkiye Cumhuriyeti Anayasasında Değişiklik Yapılmasına Dair Kanun Teklifi 2/1504.” This translates as “Proposed Law Concerning Amendment to the Constitution of the Republic of Turkey 2/1504.” The text of the legislation is contained in a parliamentary report, Parliament 26/legislative year 2, [report] number 447 , available at https://www.tbmm.gov.tr/sirasayi/donem26/yil01/ss447.pdf. This report contains a side-by-side comparison showing the amendments package as submitted to Parliament and as it emerged from the Constitution Committee, or Anayasa Komisyonu, on pp. 104–126; the latter is the form in which it Parliament passed it. The report also contains the accompanying “Genel Gerekçesi,” or “General Rationale,” on pp. 10–11, and the article-by-article explanations, or “Madde Gerekçeleri,” on pp. 12–15, as submitted by the sponsors of the legislation—in this case, the entire 317-member parliamentary delegation of the ruling AKP, minus the parliamentary speaker. It also contains the committee report on the legislation on pp. 16–45, as well the views of the opposition on pp. 46–103. Endnotes sourcing the proposed amendments package are based on the texts contained in Parliamentary Report number 447, hereafter referred to as PR/447. Turkey’s constitution, as it currently exists, is cited frequently, primarily in reference to the English text. I referred to the version found at https://global.tbmm.gov.tr/docs/constitution_en.pdf. This version includes all amendments except the most recent—regarding parliamentary immunity—passed in 2016. This constitution, in its original form, was passed by referendum in 1982. Previous constitutions were issued in 1921, 1924, and 1961. The numbers following these abbreviations, set off by slashes, indicate the referenced article. Regarding the proposed amendments, only the articles are specified in citations; PR/447 page numbers will not be cited in reference to the text of the proposed amendments.